Armed with patience, a love of gardening — and a few teeny-tiny measuring spoons — a group of volunteers packaged tens of thousands of seeds this weekend in Rochester. 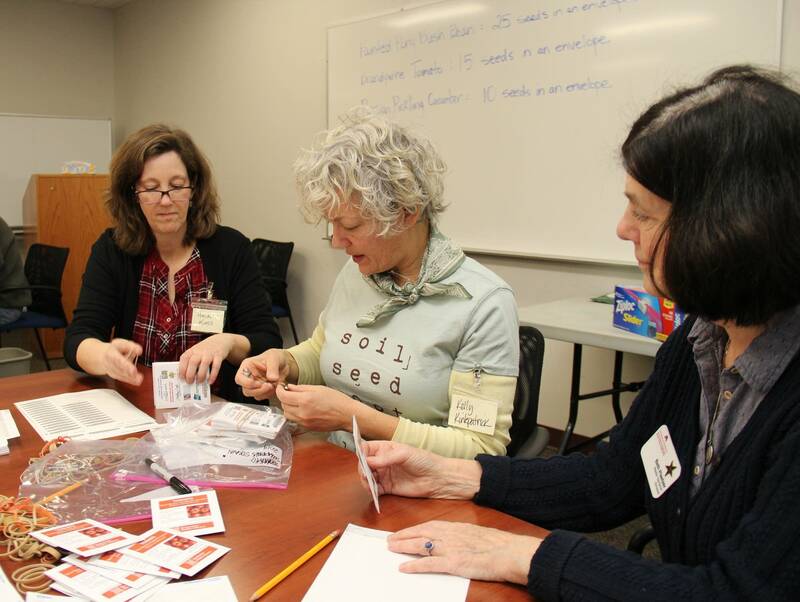 The seed-packet assembly line was in preparation for the opening of a new seed library at the Rochester Public Library. It's slated to open in March. The weekend goal was to divide 50,000 bulk-purchased seeds into 6,000 individual packets, representing more than 40 varieties of vegetables, fruits and herbs. "Everyone deserves to be able to grow their own food," said Kelly Rae Kirkpatrick of the "Plant a Seed" initiative, one of the organizers who have been working for months to make the seed library a reality. "Whether it's on their apartment railing or in pots, or (they can) get together with their apartment group and dig up a plot of land. Or eliminate some of your grass in your yard. A seed library gives the food back to the community." Kirkpatrick said that once the seed library is open, anyone with a Minnesota library card can check out up to 10 packages of vegetable, fruit and herb seeds. After harvesting the produce later this year, the hope is that some of those gardeners will save seeds to be packaged for next year. Keri Ostby, the head of technical services at Rochester Public Library, said the seed library fits with the library's mission of empowering people. "Libraries offer so much more than books these days — and seeds are just one of those things," she said. "We can give you a book on gardening and say, 'Here you go, good luck.' Or we can offer things and resources to get you actually started, going on it, learning about food resources, learning about open-pollinated seeds, learning about how to seed-save and grow your own food, and have that resource for years to come." There are seed libraries at other Minnesota libraries, but the idea is new to Rochester. Kirkpatrick and Heidi Kass pitched the idea to the library last year, starting the planning process. Last summer, organizers visited farmer's markets in Rochester to gain insights about what vegetables and herbs to include in the library. University extension educators also weighed in, with ideas for varieties that might be useful to various ethnic groups in the community. Ahead of this weekend's event, Kirkpatrick said they practiced to find the best way to organize the volunteers and fill the 6,000 seed packets. Ostby searched online for measuring spoons in very small sizes — less than 1/8 teaspoon — to use for dividing up the smallest seeds. "Larger seeds such as beans or peas we're measuring out, putting 10 or 15 in per package. Radishes might be 25, for instance," Kirkpatrick said. "But the little teeny seeds like bok choy, arugula, mizuna... and some of the really teeny ones such as epazote — which is specifically chosen for our Hispanic community, from feedback that we gathered — those seeds are so small we're going to be needing to mix them with a planting medium and putting them in the packages." Ostby said the local gardening community quickly filled the volunteer openings for the seed-packaging event. 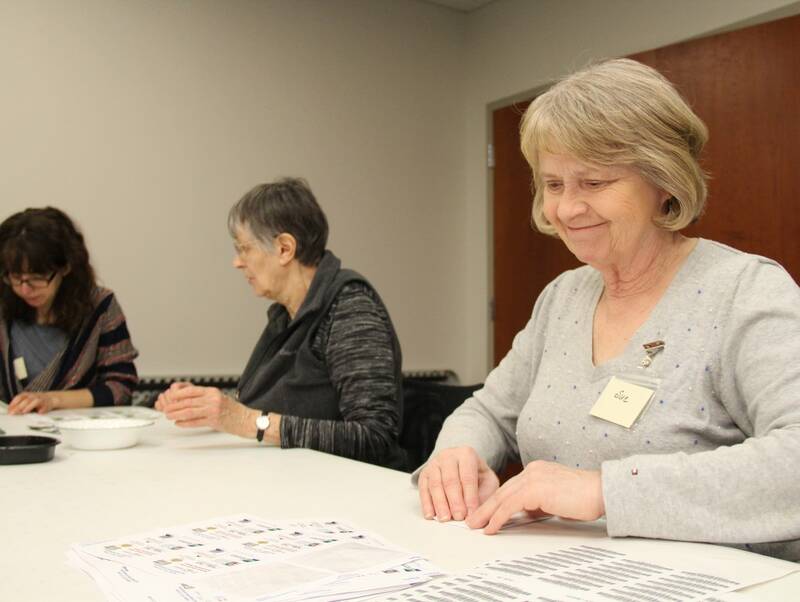 By keeping tabs on what seeds are checked out, Kirkpatrick said they hope to gauge the effect of the seed library and how to improve it in future years. Support for the seed library came from the Minnesota Arts and Cultural Heritage Fund, Minnesota Library Legacy, the Rochester Area Foundation, University of Minnesota Extension, History Center of Olmsted County, Plant a Seed and the Backyard Bounty Urban Homesteading Meetup. Find more information on the Seed Library website.